Hope y'all are having a super week. I am painting again. I know, it never stops. I just can't help it. Thank you so much for the wonderful feedback on my kitchen cabinets. That job was so worth it. There was lots of wonderful inspiration last week. Here are a few features that I chose. Check out how this fabulous kitchen island was made by Olive Out. Dixie Delights shares how this exquisite art was made into a flat screen t.v. cabinet. These gorgeous Craig's List find chairs were truly transformed. See the before at Sweet Chaos. 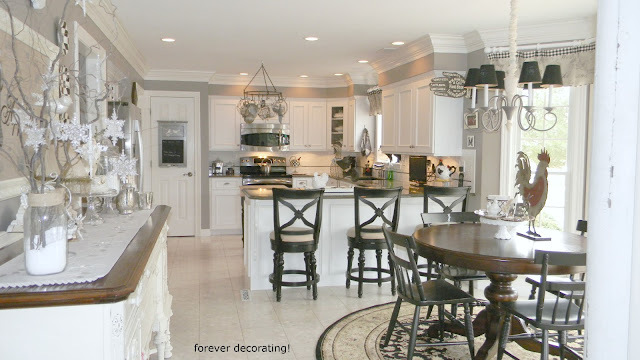 I know y'all love a good kitchen makeover and this one is a beauty by Forever Decorating. Emerald green is the Pantone color of the year and this dresser was beautifully transformed in the color by Simple Details. If you were featured please grab a "featured" button from my sidebar if you don't have one. Now we can't wait to see what you have to wow us with! Thank you so much for hosting! I love the fabric on those chairs....yes please! Hi Kim! Thanks for hosting, can't wait to check out all the great features! Beautiful colors and styles on the features, Kim. What a pretty room Eva has! Many thanks for all the fun and inspiration! Great features Kim! I just love kitchen makeovers too.Thanks for hosting WOW! Now I'm off to gather some creative ideas! Thanks for hosting Kim. Love Laura's little girls bedroom makeover. I have to go check out that kitchen now. thanks for having us over to party!! Fantastic Features Kim! Thanks for hosting. Hi Kim...wonderful features this week! Thank you so much for all the hard work which goes into hosting your fabulous weekly parties...they are always so inspirational!!! Lovely features, thanks for hosting, Kim! Thanks for hosting. Loved the features...especially that drying rack. Hope you have a wonderful week. Thanks for hosting the party. I totally missed your kitchen cabinet post, so have to go check that out. I love a good kitchen makeover! Wow, very pretty features! Thanks for hosting Kim! Lots of great features, Kim! I love the Craigslist chairs! Hi Kim! Thank you for having me again at your inspiring party. Today I am sharing my mom's recipe of winter apricot upside-down tea cake as well as a very inspiring book and some thoughts on slow living. Thanks for the feature, Kim :) I sure do love everything that you showed tonight, Olive's kitchen island has me drooling, for sure. Thanks for hosting! What incredible features - love the chairs and Eva's bedroom!!! Every week I attempt to link up but it tells me I need to create a backlink to you site. I have you button on my page. Any clue why it's not letting me link up? Thanks. Thanks for hosting, Kim. Super features, as always. Serious kitchen envy here. These are great features! Thanks for hosting each week, Kim. I have tried twice to link up and it tells me I don't have a link back. But I DO, that is how I got here!!!! Beautiful features as always. Thank you for hosting. Thanks for hosting, Kim. Great features and lovely new links! Hi Kimmie! Oh, what wonderful features and thank you for hosting your party. Eva's room is so sweet! Loving that wall color. Gotta go visit to find out it's name! Thank you so much for giving us a place to party! Hi Kim, thanks for sharing all those beautiful features and thanks for hosting! Have a great evening. Thanks so much for hosting, Kim! I love the drying racks you featured...I want some! Thanks for hosting, Kim. I'm going back and catching up on my reading. It's been a hectic week. I'm impressed and envious that you keep doing painting projects...I'm such a wimp when it comes to major projects!!!! I cannot seem to link up...I have never had problems before. It says I don't have a back link, and I do. I've tried it 3 times. Very frustrated...not sure what to do. So many great features to check out this week! Grilled cheese croutons sound fabulous.Thanks for hosting, Kim. I always love your party! Thank you for the fabulous party, Kim! Hope you are having a wonderful week...that kitchen is looking super gorgeous! Have a wonderful day and thank you for hosting. Gorgeous features Kim~ thanks so much for hosting! Eva's bedroom is just adorable! Thanks for hosting, Kim. Kim, what a pleasant surprise to come over here to check out the features and see my little drying racks! Thank you! I love the rest of the features too, as always. I have some visiting to do for sure. Thanks for your time in hosting again. Enjoy the rest of your week! Fabulous features, as usual Kim! Thanks for hosting. Amanda's great idea to conceal the tv just blows me away. So many great and creative ideas!! Thanks so much for hosting this party each week, Kim!! So many gorgeous makeovers here at your party Kim. It is really an inspiration. Thank you for hosting! These features are swoon worthy! The chair makeover? Holy wow! So many great links this week. I have way too many to read tonight. Thanks for hosting. Thanks so much, Kim, for hosting! Enjoyed seeing all the featured posts from last week's WOW....love the Pantone color of the year! Thanks so much for the party, so happy to participate!! HI Kim, thanks for getting back to me. I know it is all about codes and I must be doing something incorrect...I just don't know what. I haven't had this happen to me before...so I know it must be a mistake I am making. But I appreciate your input. I will keep working at things to see if something works. Have a great evening. And again no worries. Great choices! Thanks for hosting Kim! Oh my Kim! I'm late in linking up tonight. As I scrolled down I was amazed at all the creativity. Wow! Hi Kim; what a lovely party, so many talented bloggers. Thank you for hosting. Great features. Have a wonderful week. Thanks for hosting the party. There are some wonderful features from the last party. I love the transformed Craigslist chairs. Looking forward to visiting some of the other linkups. Wonderful features! I'm in love with little Eva's room. Thanks for hosting! Wonderful features! Thanks for hosting, Kim. What a wonderful surprise to be featured! :) The projects at your parties are always fabulous inspiration! Thanks, Kim! Great features, I already had a bunch of them pinned myself, so I'd have to say you really know how to pick 'em. I only wish I had a little girl who needed a bedroom redo. Oh, what great view of other blogs. Thanks for sharing. Those drying racks look genius. Heading over to check out that tutorial! Thanks for hosting Kim! I'm checking out your cabinet painting post. Maybe it will give me the nerve to finally paint mine. Lovely pics today! Such talented bloggers! Kim you always have so many good things to look at! Love the way your cabinets came out too!! Such amazing features! Thanks for the party! Love all the picks...thanks for hosting! Thanks so much for hosting! You have chosen some wonderful features! Love your picks from last week...thanks for hosting! Thanks for hosting, Kim....I can't seem to get any work done...so many great features and entries to check out! I have never hosted one of these Kim but I know they are so much work so thank you!!! Happy Wednesday Kim.. Thanks for hosting. Thanks for including my Entry way/ mudroom among these fabulous features! And thanks for hosting such a fun and fabulous link party! Boy, these are some beautiful features. Love that kitchen and the bedroom with the white floors. Amazing. Thanks for all the inspiring photos. Absolutely love your guidelines! Especially the yellow highlights! !